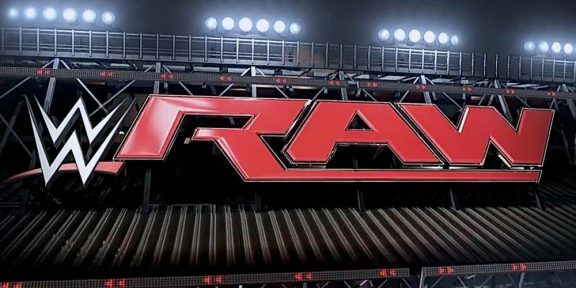 Welcome to tonight’s RAW Report. I am @TheMagnumDA. Follow me on Twitter! We are LIVE in Nawlins! That’s New Orleans for our international friends. We open with Stephanie doing a performance review with Mick Foley. Seth Rollins comes in and declares himself eligible for the Royal Rumble. This is interrupted by Braun Strowman, who wants either Roman or Goldberg. Of course, this leads to a fight between Rollins and Strowman. Foley’s haircut is even shorter than last week! So is his leash. Whoever gets the winning fall becomes the US Champion. Right before the bell sounds to start the match, BRAUN STROWMAN appears and fights Roman on the outside. Braun takes control, and throws Roman into the ring, where Jericho and Owens are waiting. 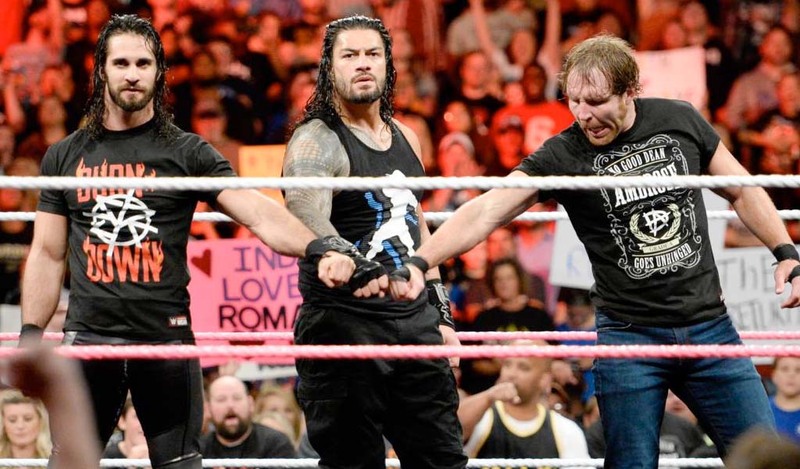 All three men beat down Roman until Seth Rollins appears! They clear the ring and start teeing off on Strowman with steel chairs. As Strowman paces around outside, Stephanie McMahon comes out and says that this handicap match will take place later tonight. As for right now? Seth Rollins gets Braun Strowman one-on-one. Rollins hits a dropkick to start, and continues the offense on the legs. Braun tries to power Rollins up, but Seth gets out and continues to attack the legs. Braun finally catches Seth, and tries to lift him by his leg. Awesome agility for Seth to kip up from this, but he’s immediately smashed into the ground. Braun hits a running splash, and continues to kick Rollins in the ribs. Strowman hits a lariat and the crowd is already asleep. Rollins tries to fight back, but Strowman stops him with a single forearm. Seth is selling the ribs and back. Strowman hits a brutal pointed elbow and continues to stomp Rollins into dust with boots. Rollins grabs Strowman’s beard, and somehow a jawbreaker spot comes out of this! Rollins catches Strowman with a hotshot over the top rope, followed by running clotheslines and kicks. Rollins runs to the ropes, but gets caught with a spinebuster. Rollins goes to the apron, but Strowman is waiting to deck him with a shoulder block. I actually like this dynamic more than last week. After the commercial, Rollins hits an enziguiri on the outside, followed by a suicide dive! He tries some kicks on Strowman, but he only gets a one-count. Rollins tries two knees from the top rope, but Strowman catches him on the second try and props him on the top rope. Strowman INTERCEPTS A BLOCKBUSTER IN MID-AIR and places him back on the top rope. That was unreal. Rollins hits a kick from the top, and catches Braun with some headbutts. Braun tumbles down and Seth hits the Frogsplash! ONE, TWO, NO! That’s the closest anyone has gotten. Crowd cheers for Rollins as he drills Strowman with a running knee on the apron. From the top, Seth tries to hit a splash outside on Strowman, but Braun moves out of the way. Strowman tries to carry Rollins’ carcass back to the ring, but he doesn’t get there by the ten-count. Wait, WHAT?! All that for this finish? *3/4 After the match, Strowman tries to get back in the ring and finish Rollins, but Seth grabs a chair and holds him at bay. I tell you what…they gave Seth a lot of offense, including being the first guy (post Draft) to knock Brauny the Strowman off his feet. Drew Brees is in the house! You blew it for me in Fantasy, dude. Bayley and Sasha are backstage getting psyched for the Royal Rumble. Then they tease Sasha vs. Bayley at WrestleMania. You never know! This brings out Charlotte, who tells both women that she’ll stay unbeaten on PPV. Then, suddenly…Nia Jax comes in and drops Sasha. Meanwhile, Bayley is caught off-guard by Charlotte, who nails her with the title belt. Charlotte thinks that she and Nia are on the same page. Charlotte is definitely wrong. Recap of last week’s 205 Live segment. I love this Gallagher dude. He’s like Conan O’Brien and Daniel Bryan rolled up into a little package. They lock up to start, and Gulak catches Jack with a spinning leg lock. While Gulak tries to get his balance, he attempts to slap Gallagher in the face but falls down. Gulak takes advantage with an AWESOME body slam into the ropes, and hits a vicious clothesline for two. Gulak wraps Jack’s arms around his neck, and keeps him locked by placing a knee on his back. Crowd tries to get behind Jack. Afterwards, Jack wants to settle his feud with Ariya Daiviri with a “parlay”. Well, if nothing else…he’s an honorable gentleman. Austin Aries just can’t wait to see this tomorrow. When he’s disingenuous, he’s even more hilarious. Foley is walking around backstage when Stephanie stops him. Stephanie says she can’t rely on Foley, and says that the job performance hinges on whether or not The Undertaker can arrive. Foley has one hour. Let the countdown begin. By the way…why does his job suddenly hinge on this appearance? Here’s Shawn Michaels! It’s Mr. WrestleMania! The Rock of Christian movies! Okay, I made that last one up. He comes out to the ring and the fans are pleased to see him. I think. Shawn tries his 90’s humor on everyone but nobody responds to it. He tells the fans he misses them, and then he says that this time of year is the best time of the year. Michaels talks about “Remembering the Rumble” in 1997, in his hometown of San Antonio. He puts over the entire roster, and the crowd boos pretty much everyone. A big “ONE MORE MATCH” chant breaks out, and then Michaels plugs his movie…? This isn’t going over well. Apparently, this movie is called “The Resurrection of Gavin Stone”. Before we go further, the IHOP KING Rusev comes out with Lana and Jinder Mahal. Rusev tells HBK to let Lana in his movie. Hilarious moment…Rusev stops everything to listen to the crowd, asking “What?” They chanted “Sweet Chin Music!” Rusev puts himself and Lana over as beautiful movie stars. Their improv is wonderful, but their scripted stuff is bogus. Somehow, this brings out Enzo and Cass. Apparently, now Enzo has a joystick with his wheelchair. Vince must really have it in for this guy. Enzo gets his digs in, and the crowd loves it. They start doing some improv, and Rusev stops them by calling them American pigs. Cass steps up and challenges Rusev, and we have a match! Wait, against Jinder Mahal. That’s a letdown. SOMEONE GET MAHAL OFF THE JUICE. Neville gets some offense early, but Dorado responds with a dropkick and a nearfall. Great springboard stunner and a legscissors sends Neville outside. Great splash by Dorado! Dorado heads up for a crossbody! One, two, NO! Neville grapples him in the corner and cheapshots him while the ref is distracted. Neville keeps up the aggression and puts Lince in an armbar. Dorado tries to fight up, but Neville immediately drops him. Neville with a nasty stomp in the ribs. Neville with a great armbar into a Northern Lights Suplex. Crowd tries to cheer Lince on, but Neville knees him in the guts and counters a frankensteiner into a FACE FIRST PLANT. Neville with a variation on the Rings of Saturn gets the submission! *3/4 I like it…more layers to Neville. He beats the living hell out of Dorado after the bell for shits and giggles. Rich Swann tries to intervene, and gets the better hand of Neville! Awesome kick to the face by Swann. He goes for the back leg reverse side kick, but Neville retreats. Bayley and Sasha talk to Stephanie McMahon backstage. Of course, Steph dresses both of them down. What did you expect? Tag Match is announced for later tonight…Bayley/Sasha vs. Charlotte/Nia Jax. Both Karl Anderson and Cesaro are on commentary for this match. Gallows takes advantage to start. Gallows is in full Tensai mode with those chaps. Shoulder tackle by Sheamus, but Luke counters with a knee, and clubs Sheamus in the corner. Sheamus hits a shoulder tackle of his own for two. Gallows once again takes advantage, but Sheamus catches him and hits the rolling senton and a running knee. Outside, Gallows hits the lariat while Cesaro recites speaking German. They go to commercial, but not before you can audibly hear Cesaro SIGH on air. I bet Vince loved that. Foley is still looking for The Undertaker. Ugh. Roman is backstage with Charlie. 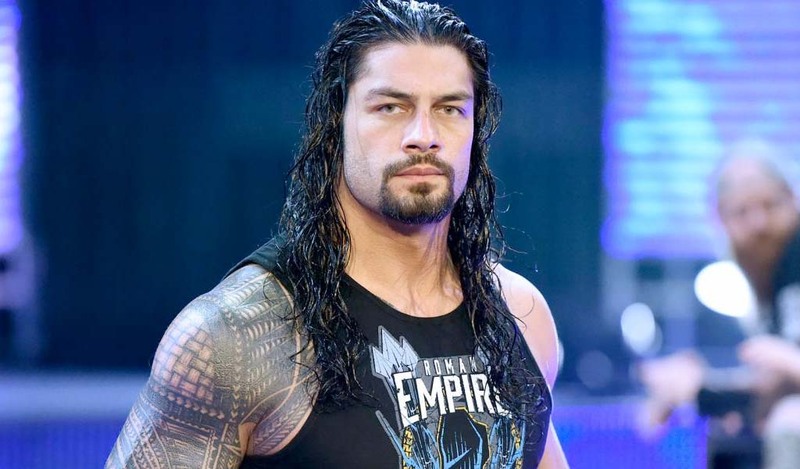 Roman says tonight won’t be any different from any night…he’ll spill their guts out. Foley is finally in the ring, asking for The Undertaker once more. Foley starts to tell a story, and the lights go out! Oops, it’s Stephanie. She starts to provide a PUBLIC performance review. Stephanie actually does a good job explaining Foley’s setbacks, but before Foley can apologize…the Dead Man Cometh. The Undertaker finally arrives, greeted by huge “Undertaker!” chants. He claims that he’s back, and he’s ENTERING THE ROYAL RUMBLE! Whooo! CAN’T WAIT. Taker tells the world, “Nobody controls The Undertaker. No one.” and shoots a DEATH GLARE at Stephanie. I love it. He mentions The Streak, and says that his journey will continue at the Rumble. Charlie is backstage with KO and Chris Jericho. Owens is angry about surprises, and is going to take it out on Roman Reigns. Jericho declares themselves the “International Treasures”. Whatever you say, Chris. Bayley and Sasha argue to start, but Bayley lets Sasha start…and then she is immediately destroyed. After the commercial, Sasha fights out of the corner and uses her injured knee to attack Charlotte. Brilliant. Bayley tags in and nails Charlotte with forearms and a running clothesline. Bayley hits a weak Stunner with Charlotte draped on the ropes. Bayley misses the Whirly Whirl and gets kicked in the mouth by Charlotte. Backstage, Noam Dar gets a kiss from Alicia Fox. Someone get that boy some clean underwear. The New Day are here! They’re now pouring cereal down fans’ throats. Literally. Wow. Apparently, they have an offer for Titus O’Neil…but FIRST! A commercial. After the break, Titus is in the ring apologizing to the New Day. He wants another chance with the New Day. They end up showing a video from him in NXT back in 2010…they reference his classic “Make It A Win” promo and his keg tumble. New Day gives Titus one more chance to carry the keg and win the contest he blew six years ago. Titus makes great time running the barrel across the ring, but he drops the keg before getting to the finish line! Oh man…Kofi teases Titus, and this somehow leads to a match! Roman attacks them outside to start. Reigns takes Jericho up the ramp and into the shark cage that’s on display. Owens interrupts and throws Reigns into the cage. The cage flies off the stage! KO and Jericho take Roman back to the ring and throw him into the steps. Roman is beaten down, but he tells the ref to start the match. Owens capitalizes and brutalizes Reigns in the corner. Jericho tags in and catches Roman with a back elbow. Jericho hits an elbow and puts Reigns in a sleeperhold. Roman escapes, and catches Jericho while he’s trying to go to the top rope. Reigns hits lariats to both KO and Jericho. This crowd is just completely flat. Reigns throws Jericho into Owens and hits the Samoan Drop on Jericho. Reigns hits the lariats in the corner, but KO counters with a clothesline of his own. Reigns counters THAT with a clothesline. Roman goes for the Superman Punch on Jericho, but KO clocks Roman and Jericho hits a Lionsault! One, two, No! Jericho tries the Walls of Jericho, but as Roman gets out…KO tags in and tries to direct traffic. Superman punch to both KO and Jericho! Reigns goes for the Spear, but Jericho catches him with a kick. Roman hits a Spear on Jericho, but KO pulls Reigns off! Outside, Reigns counters a Power Bomb from Owens into a Drive-By. Jericho tries a springboard drop kick, but he gets hit with another Superman punch! As this happens, Owens catches Reigns and drills him with a powerbomb onro the apron. Reigns is not moving. They carry the deadweight back into the ring, and Jericho hits another Codebreaker for the victory! JERICHO FINALLY WINS THE UNITED STATES CHAMPIONSHIP. ** Fans are actually appreciative of Jericho’s victory! That’s all we have for this week. The Royal Rumble’s only 3 weeks away! I’ll be there…WATCH IT.